The B-1B Lancer may have made its name supporting ground troops and destroying land-based targets, but the Air Force is now developing tactics for using the aircraft over the ocean. A B-1B Lancer from Dyess Air Force Base, Texas, alongside other bomber and fighter aircraft, participated in a maritime tactics development and evaluation Sept. 4 with the goal of improving and better understanding the aircraft's capabilities in the new environment. 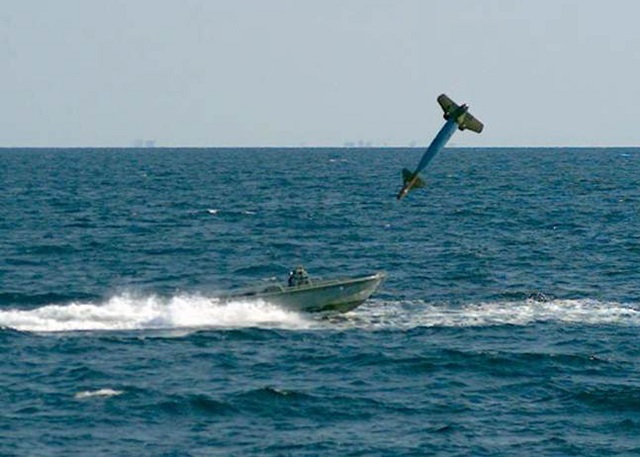 "Many of the dynamic targeting skills we've refined over the past decade on land are directly applicable in the maritime environment," said Capt. Alicia Datzman, chief of weapons and tactics for the 337th Test and Evaluations Squadron at Dyess. . "This is the perfect opportunity to validate and refine these tactics." During the evaluations, the B-1 dropped a total of six munitions to include a laser-guided, 500-pound bomb GBU-54, as well as 500 and 2,000-pound joint direct attack munitions. "This evaluation solidifies what our crew members have already known - we can strike surface targets," said Lt. Col. Alejandro Gomez, 337th special projects officer. "The knowledge we gain from these events gives combatant commanders assurance that we can be called upon to complete the mission." The B-1's role in the tactics development and evaluation exercise was to detect, target and engage small boats using currently fielded and available weapons, which were released in all weather conditions. Gomez said that B-1s are versatile aircraft, capable of protecting important assets at sea and patrolling allied shipping lanes, because of its speed and ability to stay in the air longer than most aircraft. "Future wars might not all be on land, some may include surface combat, so we are evaluating the way we employ the B-1 to aid in completing the mission," Gomez said. With the platform constantly being upgraded and new applications for the aircraft being discovered regularly, the 337th TES is often called upon to find new and innovative ways to use the Bomber. "We are the 911 of the B-1 community," Gomez said. "When something needs to be adjusted or improved for our aircraft, we are called upon to find the solution." Gomez said one of the most useful tools in the 337th TES arsenal is the TD&E. During a TD&E, data is collected in flight of all information contributing to the mission. Once completed, the aircrew examines data from the mission to determine how efficiently they tracked, engaged and destroyed the target. From there, the 337th TES develops future tactics, techniques and procedures manuals using the knowledge they've gained. With more experience in varying environments, B-1s are becoming increasingly capable of serving in joint operations with the Air Force's sister branches. "Success in these sorts of tests gives our sister services confidence that the B-1 can get the effects they need to meet combatant commander requirements both over land and sea.With the right assets supporting us, this platform is unstoppable," Gomez said. "We can't do it all alone, but by working with others, the B-1 is capable of doing so much to support our nation."